“Cold heading is basically putting material in a die and hammering on it” according to one industry expert. Unlike hot forging, where the metal is heated before forming, or casting, where the metal is melted and solidified, cold heading and other methods of cold forming cause the metal to deform at room temperature. Though there was a U.S. patent issued in 1794 for a “cold header” (really a rivet machine), cold forming became a practical fabrication technology after World War II. Modern cold-forming machines, also called headers or parts formers, provide from one to seven die stations, opposite a number of punches mounted on a slide, which usually moves horizontally. 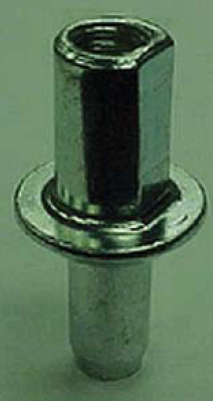 A common type used for making bolts or screws is the one-die, two-blow header, similar to the example shown. This has one die, which is the diameter of the shank of the bolt or screw being formed. The material in the die is struck with two different punches, one after the other. There is a limit to how much you can deform the material with a single blow, so two hits are often necessary to create the correct geometry of the head, said Steve Copeland, vice president of sales and marketing, Reed Machinery, Inc., Worcester, Mass. The first blow makes a shape like a tulip. Then a shifting mechanism moves the first punch over and places the second one in position. The second punch comes in to produce the finished shape of the head. After the second blow, a knockout pin pushes the piece out of the die. On a multiple-die header, there is a transfer rack with fingers that grab the part and move it from one die station to the next. If needed, the transfer mechanism can turn the part around 180 degrees so the next punch hits the other end of the part. The form of metal stock most often used in cold forming is “wire,” which may be a half-inch or more in diameter. It comes in large coils, convenient for feeding into machines making many parts per minute. When metal is compressed within a die, it is important to introduce just the right amount of material into the die, often within plus or minus one percent, or even less. Too little material won’t fill the die, making a bad part. Too much material can result in a malformed part, or produce flash that needs to be removed. The excess material can cause the die to split when the punch hits. Cold-forming machines are designed to cut off a precise length of wire, but the diameter of the wire must also be precise. To provide this, many shops will do a final draw of three to 10 percent on the wire before it is cut and formed to get a nice, tight diameter tolerance, said Kevin Hughes, specialist in wire products, Carpenter Technology Corporation, Reading, Pa. 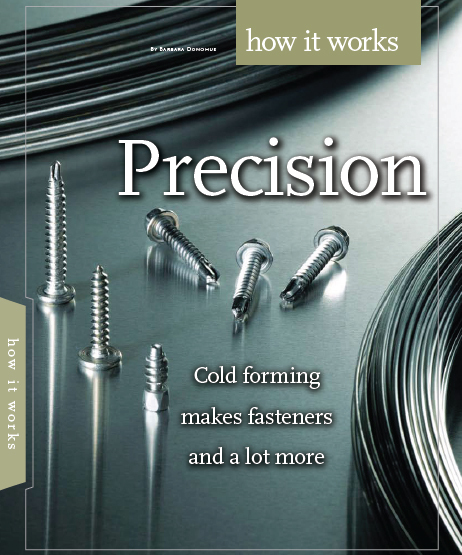 Originally, cold heading was used to create heads for fasteners. A piece of wire was held in place and an impact to one end of it caused some of the material to spread or “mushroom,” creating a head for the fastener without having to machine away a lot of material to form the shaft. Once the head was formed, then the threads could be either cut or rolled. This process not only formed the fastener quickly, but it made efficient use of the material, producing little or no scrap. 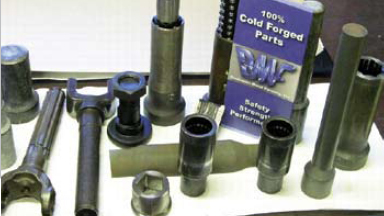 In addition to fasteners, many kinds of parts with complex shapes can be made by cold forming. The machines may be called “headers,” but they do much more than heading. Tooling can be designed to extrude the material. When the punch hits at each station, it presses the material forward into the die to create a narrowed section, taper or shank. Or the punch can press on the material within the confines of the die so the material extrudes backward over the punch, creating the walls of a hole. In addition, shapes and contours can be built into the tooling to create splines, gear teeth and other features. Upsetting, another term for heading includes forming a bulge in a cylindrical part, as well as forming a head on one end. Using sophisticated tooling producing combinations of upsetting and extrusion when the punch hits each station, a cold forming machine can produce complex parts. Dimensional tolerances and surface finishes can rival those achieved with machining, depending on the shop and precision of the tooling. So cold forming can produce parts at near-net-shape, using the minimum of material, to close tolerances, and at the rate of dozens or hundreds per minute. In addition, cold-formed parts exhibit excellent strength, as the material flows into its final form, rather than being cut, as in machining. All this goodness does not come for free, however. Tooling costs for cold forming can be significant, perhaps $5,000 to $25,000 for a tool set, depending on how complex the part’s geometry is. Lead time for design and setup to run cold-formed parts is often measured in weeks, much longer than it would take to program and set up the same part on a CNC lathe or machining center. For small quantities, cold forming may not be cost effective. What kinds of quantities are economical? It depends on the cold forming shop. Reed & Prince has recurring orders of around 1,000 for special large wood screws used in Atlantic City to repair the boardwalk, and ongoing production of many millions per year of small pins with precision grooves and knurling. Other sources recommend quantities in the hundreds of thousands or millions. Buchanan Metal Forming, Inc., Buchanan, Mich., is a cold-forging house that makes larger parts, mostly in the one- to 20-lb. range. For his process, cost effective production quantities might range from a minimum of a couple thousand to a maximum of 250,000 parts, said Chris Tapper, the company’s president and CEO. A machined part starts out with a chunk of material large enough to contain the desired part. Then you cut away everything that isn’t the part. This produces chips, which are wasted material. Cutting can also disturb the grain structure of the metal. Cold forming, however, makes very efficient use of material. It also tends to produce very strong parts, as the material flows into the desired shapes, maintaining its grain structure. And cold forming produces parts rapidly – tens or hundreds of parts per minute. Some machined parts produced in volume, especially small round work like that made on screw machines, can be made more economically by cold forming. The savings can be greater than or equal to 50 percent, said James Richardson, president of Reed & Prince Manufacturing Corporation. If a cold-formed part can replace a multiple-part assembly, the savings can be even more substantial. 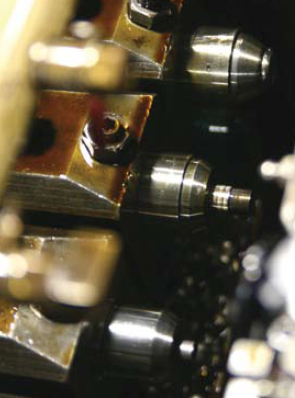 So cold forming is often thought of as a direct competitor to machining. However, a machine shop can sometimes make use of cold forming’s advantages by having the blank for a part cold formed to near net shape and then doing the finish machining. This can save on material cost and processing time. Both Richardson of Reed & Prince and Tapper of Buchanan Metal Forming reported having machine shop customers who order cold-formed blanks. At Buchanan Metal Forming, Tapper, finds that sometimes machine shops come to him with parts that are particularly challenging to machine, with an internal gear or spline, in a blind hole, for example. “One customer who had the most high-tech of shaper equipment – used to take five mins to cut an internal spline,” said Tapper. “This customer was able to cut that down to two and a half minutes. We did it in six seconds.” Buchanan cold forms the blank for the customer, who then machines it. The drawing shows a cold-forged blank with an internal spline. The broken line indicates the final machined surface. Most cold forming companies will work with their machine shop customers to determine the correct material and geometry for blanks that will be finish machined. The best material for cold forming a part may not be the same material you would use to machine it. The cold-forming company or your material supplier can work with you to determine the correct alloy for your part when it is cold formed. “Material flow and ductility are very key issues,” said Hughes. Knowledge of the behavior of materials can make the difference between a successful transition to cold forming and a frustrating experiment. Your cold-forming house will advise you, and you should be open to their recommendations. Any sulfur content in the metal would be detrimental to the heading process, for example. The qualities sulfur gives to a free-machining alloy make the material more likely to fracture during the cold forming process. So a material such as Type 303 free-machining stainless would not work. However, 302 HQ (heading quality) would be ideal. The material should be as soft as possible, ordered annealed at finish. The other thing to look for in material for cold forming is a large yield-to-tensile strength ratio. This would allow you to put in more cold work before the part fractures, Hughes said. Today’s cold-forming technology has come a long way from the simple cold-heading process used in the fastener industry for over a hundred years. While cold forming is still “taking a piece of metal and hammering on it,” the process can now produce complex, precision parts economically in large quantities. How tight of tolerances can be held on cold formed parts? For example a bolt or specialized bolt? 0.100 mm? Cold forming and cold heading is a very interesting process!